December 2, 2010 - Eurocopter Malaysia announced its first EC145 helicopter, the first of its type in Malaysia to Sabah Air Aviation which will be used for medical airlift missions in the Sabah region, north of Borneo. Sabah Air Aviation selected the EC145 after an extensive evaluation, choosing the rotary-wing aircraft for its market leadership in the helicopter emergency medical services (HEMS) sector, benefitting from a large interior that accommodates two patients and paramedics. “Helicopters have been playing a role in saving lives in many situations for decades now, and they are unbeatable for point-to-point speed,” said YB Pang Yuk Ming, the Chairman of Sabah Air Aviation. 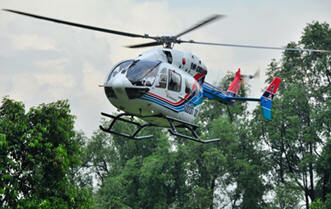 “When lives hang in balance, a helicopter air ambulance may be the difference between life and death. We are now looking forward to putting the EC145 into service.” The milestone EC145 for Sabah Air Aviation is being kept busy after its delivery by Eurocopter Malaysia. It was immediately displayed and demonstrated its capabilities for the extrication and evacuation of accident trauma victims’ mission at the Ministry of Health’s 2nd International Conference on Pre-Hospital Care and Emergency Communication System, organized by the Malaysian Society for Traumatology and Emergency Medicine and Emergency & Trauma Department of Hospital Kuala Lumpur. This conference’s theme was chosen following public concern about paramedic response time for the treatment of accident victims in a fatal Malaysian bus crash last month, which renewed the government’s efforts to define better ways of managing such disasters. Pierre Nardelli, the President and CEO of Eurocopter Malaysia, underscored how helicopters play a key role in such situations elsewhere in the world, adding that Malaysia is now moving to embrace this concept. The mid-sized, twin-engine EC145 brings together excellent performance and versatility with a large cabin and highly economic operating costs. Its compact overall footprint allows the helicopter to be operated in confined landing zones, while the high-set main and tail rotors provide unparalleled safety and access during the loading/unloading of patients – even when rotors are turning. In addition to the EC145’s worldwide use by hospitals, medical service providers, oil and gas transportation companies and parapublic operators, it has been chosen as the U.S. Army’s new Light Utility Helicopter. The EC145 was also presented to the public and private sector in a separate event on the same day at Carcosa Seri Negara, as part of a demonstration tour organized by Eurocopter Malaysia. True to its multi-role nature, the EC145 also is highly valued in the corporate sector, being the only helicopter in its category to combine a spacious cabin, smooth ride and excellent window visibility for unrivalled passenger comfort. Responding to the market’s high-end requirements, Eurocopter teamed with legendary automobile manufacturer Mercedes-Benz to develop a special edition of the EC145 with a customized layout that unites style, class and comfort with practical use. The model was first unveiled in May at the EBACE business aviation convention in Geneva, with highly positive industry feedback.